It is an all natural slow-releasing source of potassium an essential nutrient required by plants contributing to their overall hardiness and good health. It is used as both a soil amendment and fertilizer, typical NPK is 0-0-3. and is one of the best certified organic sources of potassium, OMRI listed for organic use. Being derived from undersea mineral deposit in sandy rock or sediment that were once part of the sea-bed, it has the consistency of sand but is able to absorb 10 times more moisture making it an exceptional soil conditioner. Not only is it a rich source of potassium but the naturally occurring Iron-Potassium Silicate contains, magnesium, iron and silica as well as many trace minerals that are important to plant health and growth. Apply green-sand to enhance soil structure. Adding potassium rich green-sand to your garden helps to increase root growth of plants. 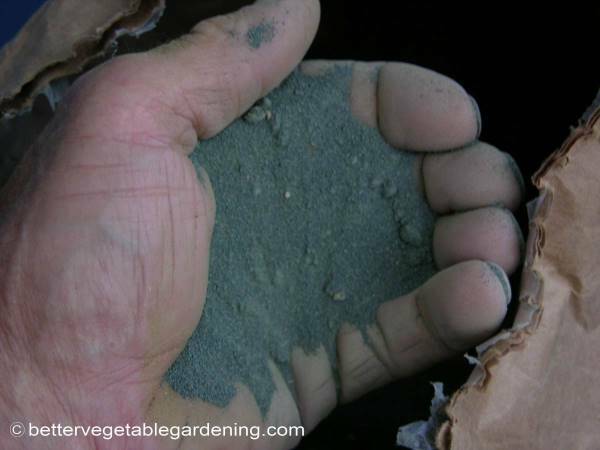 Green sand can be added to the soil surface and allowed to slowly perculate down into the garden or blended into the soil by spade, fork or tiller. It improves plant health in general by making nutrients more available in whatever soil you have. Loosen’s heavy clay soils, the additional looseness of the soil will increase the supply of oxygen to the growing roots. Helps to improve the moisture retention of sandy soils, making them more drought tolerant. Green-sand is often used in potting soil to provide a slow release potassium and in time can improve soil structure. This is fine for potted plants that are permanent residence in those pots. However because this source of potash is very slow release and is available to plants at relatively small amounts at any one time it has limited use in potting mixes for quick growing vegetable seedlings that spend very little time in seedling pots.